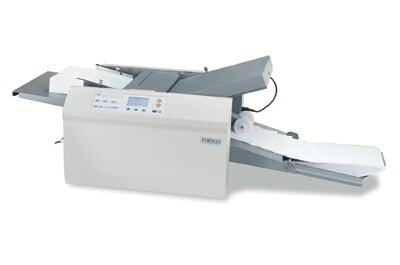 The Formax AutoSeal® FD 2054 Pressure Sealer is a fully automatic pressure sealer which provides the ultimate tabletop solution for processing pressure sensitive one-piece mailers. Designed with ease of operation and efficiency in mind, the FD 2054 automatically detects and adjusts for 11”, 14” and 17” forms. It features 5 pre-programmed standard folds for even panel C, V, Z and uneven/eccentric C and Z folds. It also has the ability to store up to 35 custom fold settings with the simple touch of a button.